MyTextTwister is a free Windows 8 text effects app available under ‘Social’ section of Windows 8 app store. This text effects app for Windows 8 lets you add amazing effects and decorate text with cool ASCII arts. Basically, you can convert text to rounded, upside-down, artistic, leet speak, and many more text effects along with other ASCII art decorations. The ASCII art decorations is available in five different categories including Hearts, Characters, Greetings, Exclamations, and Assorted. Once you are done with your text designing, you can now copy or share it with others from within the Windows 8 text effects app. As you open the text effects Windows 8 app, you will find ‘Your Text’ box wherein, you need to input the text and select the effect (given at the right-side) you would like to apply on the added text ? the result can be seen in the given ‘Twisted Text’ box. If you want to decorate your text, just click on ‘Decorate’ button ? select the category and click on the art that you want to select. You can now click on ‘Share’ button to share the text or click on ‘Copy’ button to copy text to clipboard. Below given are the main features of this Windows 8 text effects app. Lets you add amazing effects such as Upside down, Geeky, Artistic, Mix Mode, Mirror Image, Small Big, Inflated, etc. 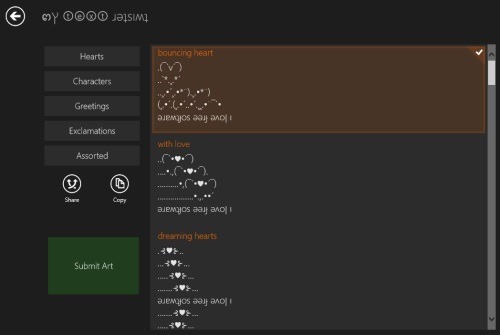 Lets you decorate text with cool ASCII arts in various categories such as Hearts, Characters, Greetings, Exclamations, and Assorted. Lets you copy the decorated text to clipboard or share it with others from within the app. I really found this Windows 8 text effects app entertaining using which you can play around with text, decorate it, copy it, or just share it with others. It’s very easy to download text effects app for Windows 8. Also, check out our posts on URL Shortner App. Open this link in IE10 and click on ‘Open in Windows Store’. Now, you can proceed with further installation steps by clicking on ‘Install’ button. In short, MyTextTwister is a good entertaining text effects Windows 8 app to decorate text and use it in making greetings, proposing your soul mate, playing pranks with friends, sending crazy message to your loved ones. Go ahead and download MyTextTwister app in Windows 8 now!